Much was made of the trade of All-Star defenseman Brian Campbell from the Buffalo Sabres to the San Jose Sharks at the Feb. 26 trade deadline. Not to be forgotten, however, is the fact the Sabres received a valuable player in return with the acquisition of former first-round draft choice Steve Bernier. At the time of the deal, Buffalo General Manager Darcy Regier pointed to the inability to settle on a new contract with Campbell and the state of his then injury-riddled team as the primary issues in dealing Campbell. In the end, Regier decided adding Bernier, a young and physical right wing, and a first-round draft choice from San Jose this June, were enough. "Steve is a guy that has some life in him," Buffalo coach Lindy Ruff said. "He's happy to be here and excited to be a part of our team." The trade certainly provides Bernier with the opportunity to showcase his tenacity and passion, attributes that were highly desirable when San Jose selected him in the first round (16th overall) of the 2003 Entry Draft. At the same time, defensive prospects Nathan Paetsch and Andrej Sekera will now gain valuable ice time and experience down the stretch in Buffalo's quest for a playoff berth. "I play a physical game, so that's what I intend to bring every night," Bernier told NHL.com. "In San Jose, I learned a lot about the defensive side of the game and playing in your own end. At first, it was difficult, but having spent three years in San Jose, I came to Buffalo with a lot of knowledge. I want to be good in the corners in the offensive zone in order to create space for my linemates. I also want to be aggressive in front of the net because that's where you score the goals and make things happen. That's where I want to be." Bernier has thrived playing the role of defensive forward this season. He is second on the team with 139 hits and is 10th with 28 points (15 goals) in 64 games. In five games with Buffalo, the 22-year-old Canadian has two goals and three assists. 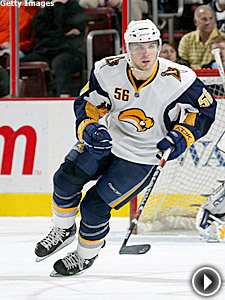 He enjoyed quite a Sabres debut on Feb. 27, playing on a line with Derek Roy and Thomas Vanek, scoring two goals and an assist and finishing a plus-3 in an 8-4 victory over Nashville. "It was awesome to come in and contribute like that because I really wanted to prove it was a good trade for both teams," Bernier said. "I know what a great player Brian Campbell is, but the Buffalo coaching staff made me very comfortable. They said; 'We don't want you to be him, we want you to be you,' and that felt good. I want to prove to my teammates that I'm here to win and help them become a better team. "That first game was great, but it's just one game," Bernier said. "We went on to lose the next two, so I'm going to have to play with the intensity I had in that first one the rest of the season. When you get traded, there's that initial boost, but after a few days, that adrenaline drops and you lose some of that energy that you initially had. I think that's what happened to me. I'm not going to put pressure on myself, but I'm out to improve." Bernier, held pointless in two games following his memorable opening night for Buffalo, did just that when he dished two assists in a 5-2 victory over the Flyers on March 4. Roy, who has 26 goals and 59 points this season, likes what he sees in Bernier. "He's a big power-forward with some skill and speed and he brings that physical presence heading into the corners to dig out the puck," Roy told NHL.com. "He's able to make plays and that's something we need. He'll take some chances, but we know Steve's a guy who'll play hard every night." At 6-foot-2, 225 pounds, Bernier feels no need to take a back seat to anyone either, as evidenced by his 62 penalty minutes this season. For his career, Bernier has 86 points (44 goals) in 165 games. He played junior hockey with Moncton of the Quebec League, where he had 151 goals, 162 assists and 335 penalty minutes in 271 games over four seasons. Bernier admitted a turning point for him was during a rehabilitation stint of a broken toe suffered Jan. 20, 2007 while playing for the Worchester Sharks of the American Hockey League. It was at that time Sharks' strength and conditioning coach Mike Potenza gave Bernier a rigorous training regimen that helped rekindle his on-ice performance. "I learned so much more about my body and its limits," Bernier said. "Mike (Potenza) trained with me for about a month after the injury and my body changed; it was like I became a different person. That hard training really prepared me for the physical grind on the ice and I've had a lot more confidence playing that style. I've also been given some great advice from our trainer here in Buffalo (Doug McKenney) and it's certainly something I want to continue. I realize that if I train hard, I'll feel better and that'll improve my overall performance."